My two year old talks a big game, but she normally doesn’t come through. For example, she talked up a storm about sitting with Santa, but then she wouldn’t go near him with a ten foot pole. Over the weekend we were in VA at the mall with my in-laws and Riley talked a big game then too, but she’d only wave to the Easter Bunny. 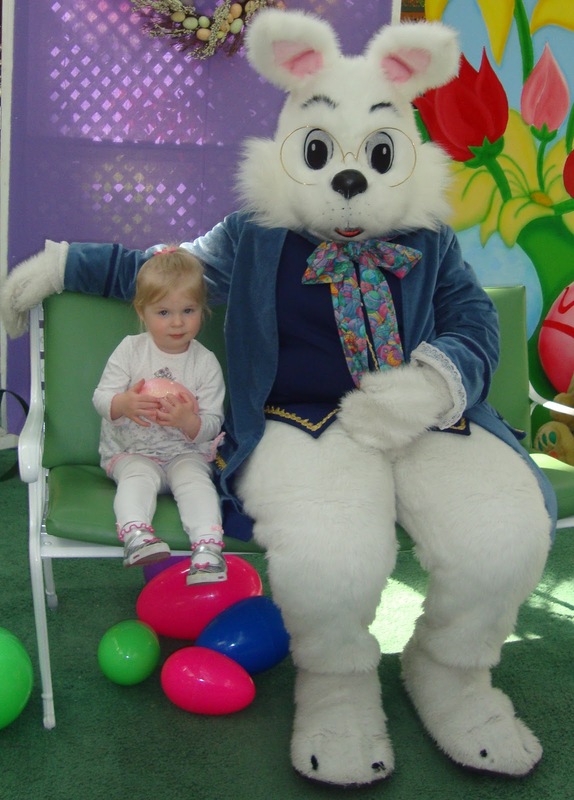 So when we were on our way to the mall to pick up her Easter dress, I thought nothing of her telling me she was going to go see the Easter Bunny and sit on his lap. Low and behold she came through! Well, almost. She didn’t end up on his lap, but close enough right?! So after conquering the Easter Bunny (and yes I bought the ridiculously priced pictures at the mall even though I clearly got a good shot, just because I was so excited) this mama needed to get her cupcake baking on. 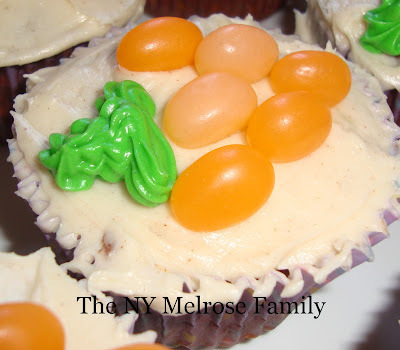 We had to have a cupcake for the Easter Bunny. 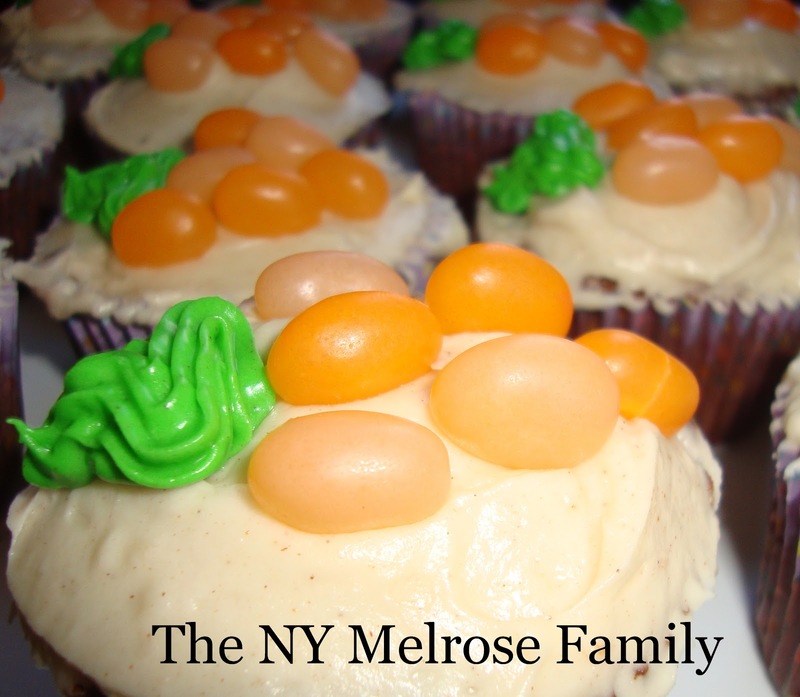 Riley and I made carrot cake cupcakes with cream cheese frosting and a carrot on top. 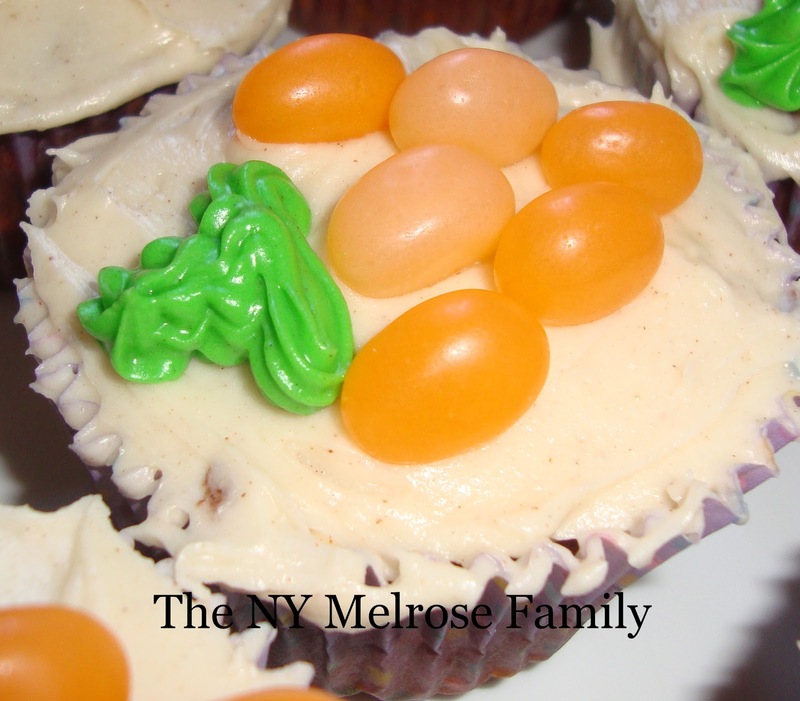 The carrot was made with Jolly Rancher jellybeans and the leaf part was made with the cream cheese frosting just colored green. They are delicious! I’m sure the Easter Bunny will love them! I’m normally not a big fan of frosting unless it’s buttercream, but this was great. I used the recipe from Half Baked Baker and adjusted it to the amount of milk that I needed to give it a creamy texture. Now what do I leave the Easter Bunny to drink? These are super cute and look so easy too!! I love carrot cake! I was thinking about making one for Easter. Your frosting recipe sounds yummy! I want one!!! Ur baking always turns out so adorable!! Your frosting sounds so good. Thanks for the recipe. I'm a new linky follower. Stop over and visit me sometime. Happy Easter! Super Cute Jenny! 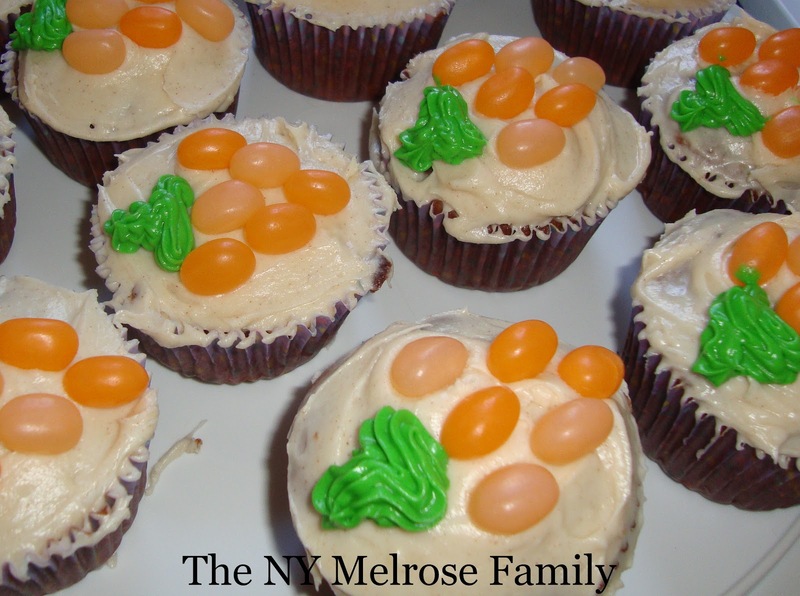 I love how you used the jelly beans to shape the little carrot! FUN! Happy Easter Lady!! Yummy cupcakes!!! These are adorable! And My 2 year old wouldn't go near the easter bunny, cried when I un-buckled his stroller… so nope! These look SO delicious!! I'm jealous of your Easter Bunny! 🙂 Thanks for sharing at oopsey daisy! Very cute!! She got much closer than mine did at 2 at least without Mommy next to her. All of our pictures with Santa or the Easter Bunny are family shots or at least one of us is holding her. This year I was amazed to get one of her with the EB. Thank you for sharing at Sharing Saturday! I hope you are having a great week! We love carrot cake and your decorations are so cute! Thanks for sharing at out party! What a fun thing to do with your daughter! They look yummy. Thanks so much for linking up to Terrific Tuesdays. She is just precious! I love your cupcakes,too! I have never made cream cheese frosting with cinnamon, but I bet it is delicious! Hope you guys had a wonderful Easter! Thanks for linking up to Serenity Saturday link party. hope to see you there today! Those are cute! Love the carrots. Very cute cupcakes! Something to pin for next Easter! Those cupcakes are so cute! I'll definitely need to remember them for next year. I'm pinning it! I just want to tell you that I am very new to blogs and actually enjoyed you’re web site. Probably I’m planning to bookmark your blog post . You definitely have awesome articles and reviews. Thanks a lot for sharing your website.